Russian private microchip manufacturer MCST has announced the launch of the production of Russian eight-core microprocessors, which, the manufacturers hope, will replace Intel and AMD processors on the domestic market. However, some experts are skeptical about the market prospects of Russian microprocessors. In early 2014, the Moscow Center of SPARC Technologies (MCST) launched a test production of Elbrus-8C eight-core processors (topology 28 nm, proprietary 64-bit architecture, clock speed 3.3 GHz, computation capacity 250 GFlops). Its development began in 2011 on a commission from the Industry and Trade Ministry, which has invested $24.4 million in the project. The manufacturers promise to produce around 300 Elbrus-8C microchips by the end of 2014. In future, MCST intends to produce servers, workstations and telecom equipment based on its microchips. Elbrus-8C is the first eight-core processor to be made by a Russian company. 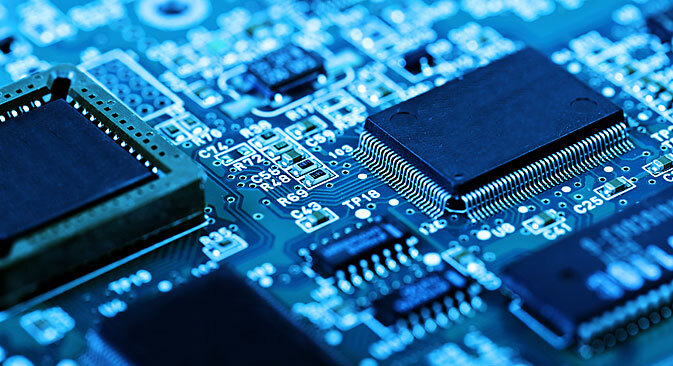 Several months ago the Industry and Trade Ministry and the Defense Ministry raised the issue of substituting imported electronics, in particular Intel and AMD processors, in connection with the latest U.S. and EU sanctions and the political confrontation over Ukraine. MCST expects that the list of potential customers for the new microchip will include major Russian manufacturers of computer equipment such as Depo Computers, Kraftway, and Akvarius. In 2012, Kraftway launched the production of all-in-one PCs based on MCST's previous-generation processor, Elbrus-2C. However, due to the small scale of production, the price of each unit exceeded $3,000, which prevented it from making it to the general market. This time round, according to MCST's Konstantin Trushkin, the company hopes to sell its Elbrus-8C-based products to universities and state structures in the expectation that this will allow it to expand production and thus reduce the price. These plans are supported by the Industry and Trade Ministry's statistics: according to it, state companies and organizations purchase about 700,000 personal devices every year worth a total of $500 million as well as 300,000 servers worth $800 million, with the overall market amounting to $3.5 billion. "Elbrus-8C microchips will be made abroad. In Russia, there is no technological capacity for that. Our microprocessors will be manufactured by Taiwan's TSMC," Trushkin said in an interview with the Kommersant newspaper. In addition to Elbrus microchips, MCST is working on a more powerful microchip: In May 2014, it signed a contract with the Industry and Trade Ministry for the development of a 64-bit processor, El-16C, with a process of under 20 nm, and eight to 16 cores. The chip is expected to be developed by November 2018 and is proposed to be used for the needs of the Russian Ministry of Defense. Experts are not convinced that the new microprocessor has much potential. According to Oleg Kolenchenko, a hardware reviewer at the specialist magazine Ferra, Elbrus microprocessors are unlikely to be in a position to compete with Intel, AMD and IBM. "However, one should not underestimate the significance of work on new microprocessors. The release of the Elbrus-8C is a very important step forward. All the more so since its architecture features several very interesting technologies, especially those to do with security, and the microprocessor performs its defense sector tasks, which it was commissioned for in the first place, very confidently," Kolenchenko says. Intel representatives do not yet see any threats to its operations in Russia either. "We are an American company and, of course, comply with the U.S. authorities' decisions. However, judging by the information about the sanctions that is in the public domain at present, Intel will not have to adjust its operations in Russia in any way," Intel's regional director for the CIS Dmitry Konash has told RBTH. "We do not supply anything directly to the companies on the sanctions list or controlled by individuals who are on the sanctions list. We have a number of clients in Russia who we work with directly, on technology consulting projects." In addition to MCST, there are several more Russian companies manufacturing computers and microchips for them: Rover Computers, best known for its RoverBook laptops; DEPO Computers, which focuses on the production of desktop computers and servers; and Desten, which manufactures home and specialist office PCs.